Can I Give My Cat Seaweed? We have always known that we should endeavor to pack in the vegetables, especially the green and leafy ones, but we have only recently become truly enthusiastic about them. 20 years ago, we considered ourselves set if we put a little bit of spinach into our salad. Today, our food is packed with all sorts of green vegetables. We sneak spinach into everything from smoothies to pancakes, we turn bowls of hot cereal green with spirulina powder, we make baked chips out of kale leaves, and some of us have even figured out how to put broccoli into baked goods. 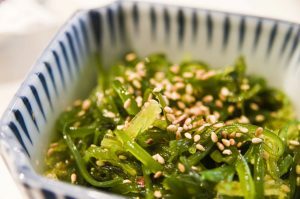 One of the most highly praised green vegetables, however, is seaweed. A longtime staple of sushi fans, seaweed has earned a reputation as a superfood in recent years. Even people who rarely consume sushi have started working sea vegetables into their diets, and many food companies have created both snack foods and meal replacements that contain seaweed. The Internet is full of sources praising seaweed for its impact on human health, but if you share your home with companion animals, you have other questions. Seaweed may grant you eternal youth, but what will it do for your pets? Can cats have seaweed? The answer is yes, cats can eat small quantities of seaweed. According to some sources, seaweed is actually one of the best vegetables you could give your cats—it is nontoxic, generally well tolerated, and positively loaded with beneficial micronutrients and antioxidants. Because it is free of any substances that are poisonous to cats, there is no need to scurry off to the animal hospital if your cat accidentally consumes a large quantity in one sitting.  Still, seaweed is a medicinal food, and it should be treated as such; your cat should not eat large amounts of seaweed on a regular basis. Strangely enough, most cats love seaweed. It is one of a handful of vegetables that almost all cats will gobble up eagerly—which means that it is up to you to make sure they eat it in moderation! It turns out that this superfood offers cats many of the same health benefits it offers us. Thanks to its high levels of antioxidants, seaweed is a powerful protective food. The antioxidants found in sea vegetables can protect feline health by neutralizing dangerous particles called free radicals.  Left unchecked, free radicals can cause damage to body cells that can lead to chronic or life-threatening diseases such as arthritis and some forms of cancer. Because free radicals are inescapable (they come not only from unhealthy food, stress, and environmental factors, but also from ordinary and necessary processes like breathing and digestion), supplementing with foods containing antioxidants are one of the best defenses against their harmful effects. The antioxidants in sea vegetables may also be able to alleviate the suffering associated with existing illness. Because of their anti-inflammatory effects, antioxidants may reduce joint swelling, which can decrease pain levels and increase joint mobility. Antioxidants may also reduce your cat’s risk of infections (including the common cold) and slow the physical and mental decline associated with aging. Seaweed is also a low-calorie food that may help manage blood glucose levels in cats who are overweight or diabetic. While seaweed certainly will not prevent or cure diabetes (especially not if your cat is eating a lot of high-carbohydrate table scraps), it may help improve insulin sensitivity in conjunction with weight loss and an overall healthy diet. If you suspect that your cat has any insulin-related problems, have them examined by a veterinarian! You should never attempt to treat your cat’s illnesses without a diagnosis from a veterinarian. If your cat has undiagnosed diabetes, they need treatment, not vegetables. As with most things, moderation is the key to feeding seaweed to cats safely. If you decide to give your cat seaweed, purchase the high-quality, human grade stuff, and give it to them fresh. 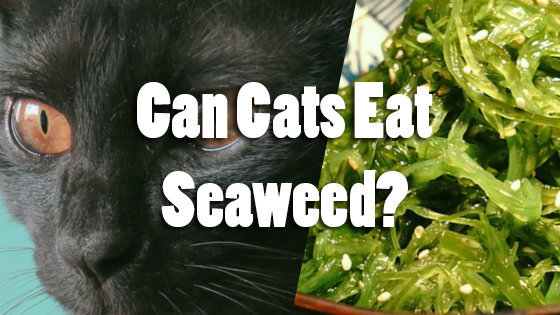 Give them a small portion of seaweed as a treat on occasion, but don’t give it to them in large amounts—your cat should not be eating sea vegetable salads. Feeding your furry friend too much seaweed can cause nutritional imbalances and stomach problems. Because your cat is not used to eating large amounts of fiber, eating too much seaweed will probably cause nausea, bloating, or diarrhea. If your cat reacts poorly to their first taste of seaweed, consult a veterinarian before giving them another bite. In conclusion, cats can eat seaweed as a dietary supplement or a treat. This green superfood offers many of the same health benefits to our cats that it does to us, but it should not be consumed in large quantities. Because most cats love the taste of seaweed, it is up to you to regulate their intake. If you want to include this food as a daily supplement, consult a veterinarian first. Can Dogs Eat Boiled Eggs? Can Cats Eat Prawns?